1. Have you ever bought from Betterbee before? If you have not, thank you for choosing us, and please use either Guest Checkout or Create a New Betterbee Account and Website Login areas. If you fill out the information in Create an Account, you will be able to login again to see tracking or order history, and your information will not need to be typed in again unless it changes. 2. 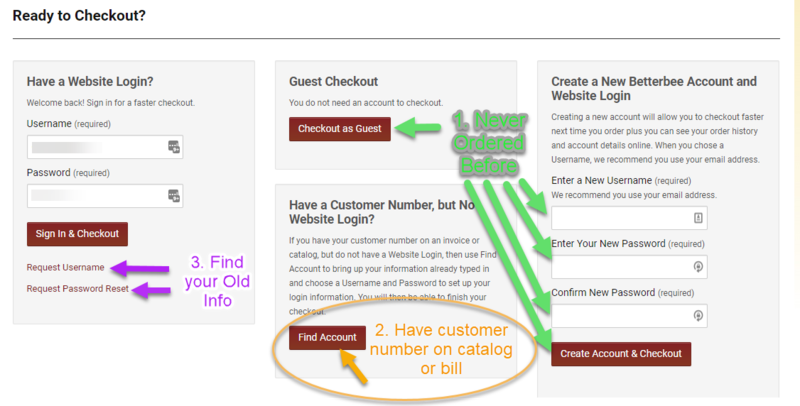 If you have bought from Betterbee and have your account number (on our invoices and on the address area of a catalog mailed to you), then you can use Have a Customer Number, but No Website Login? That will have you make a login and will pull your information on file for the account number. You will need some other information you should know to access this. 3. If you have logged on before, but cannot remember particular information to use to login, click on the Request Username or Request Password Reset under the Have a Website Login section. Those links should send you an email within a minute or two. Make sure to check your SPAM filter if you do not see it.